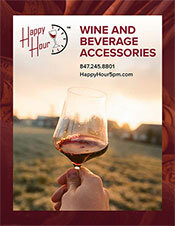 Check back often to see the latest 'Item of the Week' products from Happy Hour. Our item of the week is Dips on Ice - Dip Chiller! Our item of the week is Happy Hour Drink Stickers! Our item of the week is the Stemless Jeweled Wine Glass - Heart! Our item of the week is Silver & Silver Glitter Portable Wine Carrier! Our item of the week is the Black/Gold Reversible Glitter Wine Purse! Our item of the week is the Sailboat Wall Art! Our item of the week is our new Pink Glitter Wine Purse! Our item of the week is the Bachelorette Hand Bag and High Heel Stopper Set! Our item of the week is the Pink Ribbon Jeweled Wine Glass! Our item of the week is the Happy Birthday Music Box Wine Stopper!